The Mongol invasions of Japan (元寇, Genkō), which took place in 1274 and 1281, were major military efforts undertaken by Kublai Khan to conquer the Japanese archipelago after the submission of Goryeo (Korea) to vassaldom. Ultimately a failure, the invasion attempts are of macro-historical importance because they set a limit on Mongol expansion and rank as nation-defining events in the history of Japan. Japan at the time was ruled by the Shikken (shogunate regents) of the Hōjō clan, who had intermarried with and wrested control from Minamoto no Yoriie, shōgun of the Kamakura shogunate, after his death in 1203. The inner circle of the Hōjō clan had become so preeminent that they no longer consulted the council of the shogunate (Hyōjō (評定)), the Imperial Court of Kyoto, or their gokenin vassals, and made their decisions at private meetings in their residences (yoriai (寄合)). After acknowledging its importance, the Imperial Court led great prayer services to calm local residents, and much government business was put off to deal with this crisis. 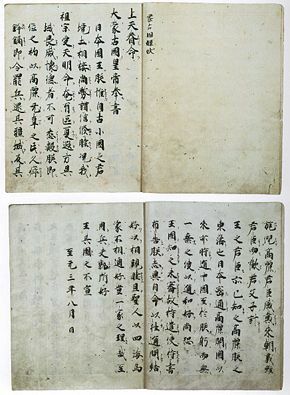 According to the Yuanshi, the Yuan fleet set out with an estimated 15,000 Mongol and Chinese soldiers and 1,600–8,000 Korean soldiers in 300 large vessels and 400–500 smaller craft along with several thousand sailors, although figures vary considerably depending on the source and many modern historians consider the numbers exaggerated. They landed on Komodahama beach on Tsushima Island on October 5, 1274. Sō Sukekuni, governor of Tsushima, led a cavalry unit of 80 to defend the island, but he and his outnumbered unit were killed in the engagement. The Mongol forces landed on November 19 in Hakata Bay, a short distance from Dazaifu, the ancient administrative capital of Kyūshū. The following day brought the Battle of Bun'ei (文永の役), also known as the "First Battle of Hakata Bay". The Japanese coalition force opposing them included 120 armed samurai each with a warband and likely numbered between 3,000 and 6,000 strong. Later accounts have both sides believing themselves to be drastically outnumbered by the enemy; the Yuanshi provides an estimate of 102,000 for the Japanese force, while the Japanese Hachiman Gudokun describes the invaders as outnumbering the Japanese 10 to 1. Conlan argues that the Yuanshi's account of the battle suggests that both the Japanese and Yuan forces were of similar size. Conlan estimated that both armies numbered around 3,000 each (not including the Yuan sailors). Around nightfall, the Mongol ship captains suggested that the land force reembark in order to avoid the risk of being marooned on Japanese soil. Hong Dagu, the commander of the exhausted Mongolian army, further decided in a military meeting for withdrawal from Japan. For the ships at that time the navigation to north, i.e. from Hakata to Korea's south-eastern shores, was risky, if not in daytime and under south wind. However, they pressed ahead the retreating action in night and met a stormy wind. Some accounts offer casualty reports that suggest 200 Mongol ships were lost. However, small Japanese boats were much more swift and maneuverable than Mongol ships, and the Japanese were able to board the remaining ships of the crippled Mongol army. The samurai approached and boarded the ships under cover of darkness and fell on the invaders ferociously. In the small confines of the ships, during the predawn darkness, the Mongols (trained as cavalrymen and horse archers) were unable to bring their bows to bear effectively. However, the long, thin Japanese swords got stuck and snapped off in the thick, boiled leather armor of the Mongols, causing Japanese blacksmiths to reevaluate their swords after the first invasion. This led to the beginning of the divergence of the katana from existing tachi swords in the 13th and 14th century. On October 5, About 1,000 soldiers of the Mongolian Army landed at Komoda Beach. Sō Sukekuni [ja] (宗助国), Shugodai of Tsushima Island was killed in action. The Mongolians slaughtered many dwellers of Tsushima island. On October 14, Taira no Kagetaka [ja], Shugodai of Iki led about 100 soldiers. They were defeated by the Mongolian army and he committed suicide in Hizume Castle (樋詰城). About 1,000 Japanese soldiers were killed there. On October 16 to 17, the Mongolian army attacked the base of the Sashi clan. Hundreds of Japanese soldiers and Sashi Fusashi [ja], Sashi Tomaru (佐志留) and Sashi Isamu (佐志勇) were killed. Thousands of Mongolian soldiers were massed in Torikai-Gata. Takezaki Suenaga (竹崎季長), one of the Japanese commanders, attacked the Mongolian army and fought them. Soon, reinforcements led by Shiraishi Michiyasu [ja] arrived and defeated the Mongolians soundly. The Mongolian casualties of this battle were about 3,500. Due to the defeat in battle of Torikai-Gata, the Mongolian army was exhausted and withdrew to their ships. On seeing this situation, the Japanese army engaged in night attacks and killed many soldiers. Finally, Hong Dagu decided to withdraw to the Yuan-held continent. In the midst of withdrawal, they met a stormy wind, most of their ships sank and many soldiers drowned. Starting in 1274, the shogunate increased efforts to defend against the second invasion, which they thought was sure to come. In addition to better organizing the samurai of Kyūshū, they ordered the construction of forts and a large stone wall (石塁, Sekirui), and other defensive structures at many potential landing points, including Hakata Bay, where a two-meter-high (6.6 ft) wall was constructed in 1276. In the spring of 1281, the Mongols sent two separate forces. Per the Yuanshi, an impressive force of 900 ships containing 17,000 sailors, 10,000 Korean soldiers, and 15,000 Mongols and Chinese set out from Masan, Korea, while an even larger force of 100,000 sailed from southern China in 3,500 ships, for a combined force of 142,000 soldiers and sailors. Japanese sources also mention 150,000 men in the invading force. Many modern historians believe these to be exaggerated figures, as were common in medieval chronicles. Professor Thomas Conlan states that they were likely exaggerated by an order of magnitude (implying 14,000 soldiers and sailors), expressing skepticism that a medieval kingdom managed an invasion on the scale of D-Day during World War II across over ten times the distance, and questions if even 10,000 soldiers attacked Japan in 1281. Morris Rossabbi states that Conlan was correct in his assertion that the invasion force was much smaller than traditionally believed, but argues that the expenditures lavished on the mission confirm that the fighting force was sizable and much larger than 10,000 soldiers and 4,000 sailors. He puts forward the alternative figure of 70,000 soldiers and sailors, half of what is spoken of in the Yuanshi and later Japanese claims. Turnbull thinks that 140,000+ is an exaggeration, but does not offer his own precise estimate for the size of the army. Rather, he only states that given the contributions of the Southern Song, the second invasion should have been around three times larger than the first. As he earlier listed the common figure of 23,000 for the first invasion uncritically, unlike the estimate of 140,000+ for the second, that would imply an invasion force of ~70,000, on par with Rossabbi's estimate. On June 3, the Mongolians attempted a landing on Shikano island, but were unable to make significant advances. By June 6, Mongolian forces had control of most of the island, but on the morning of June 8, the Japanese army divided their force into two and attacked along Umi no Nakamichi. The Japanese army lost 300 soldiers but defeated Hong Dagu, who nearly died in this battle, and Zhang Cheng. ^ a b Stephen Turnbull (19 February 2013). The Mongol Invasions of Japan 1274 and 1281. Osprey Publishing. pp. 41–42. ISBN 978-1-4728-0045-9. Retrieved 16 April 2013. ^ "常立寺". www.kamakura-burabura.com. Archived from the original on 12 August 2017. Retrieved 30 April 2018. ^ Emanuel, Kerry; Emanuel, Professor Department of Earth Atmospheric and Planetary Sciences Program in Atmospheres Oceans and Climate Kerry (1 September 2005). "Divine Wind: The History and Science of Hurricanes". Oxford University Press, USA. Retrieved 30 April 2018 – via Google Books. ^ "The Mongols in World History | Asia Topics in World History". afe.easia.columbia.edu. Archived from the original on 2007-09-27. Retrieved 2018-04-05.